Can you even believe that summer is almost upon us? 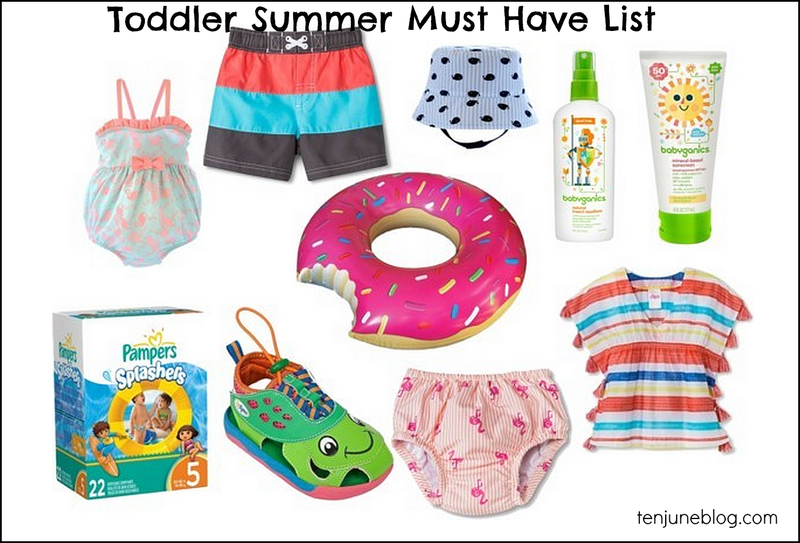 Our neighborhood pool is opening this weekend and it's got me thinking about all of the must have items I need for my tots this summer. At 14 months and 2.5 years old, the kids are at a great age to enjoy the summer fun, as long as we are well-equipped! 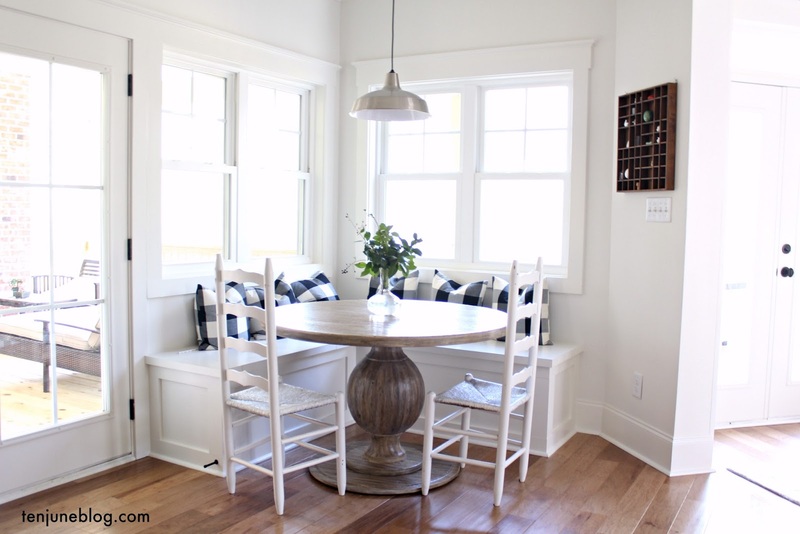 The round up I shared above lists all of my favorite baby summer items- and guess what? Everything you see is from the one and only Target! This week, Target has an ahhh-mazz-inggg baby sale going on. The sale is currently running and lasts through Saturday, May 16th. 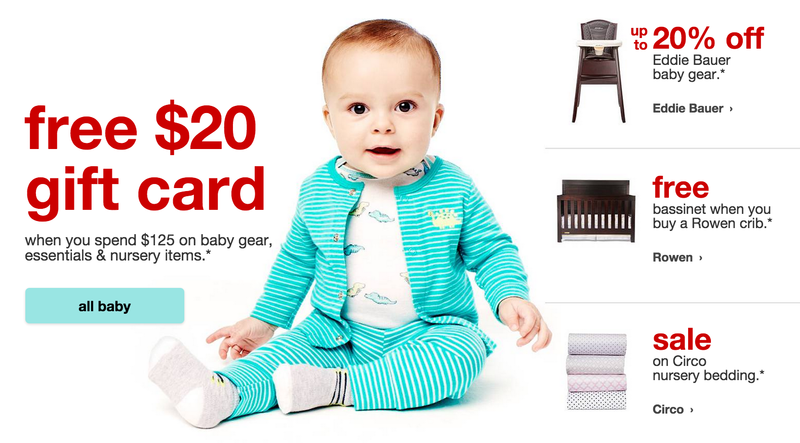 Deals from the sale include: ALL Eddie Bauer for Target baby gear is on sale, a FREE bassinet with purchase of the Rowan crib, FREE $20 Target gift card with any baby purchase (excluding apparel) of $125 or more and a FREE $10 Target gift card with the purchase of two Pampers or Huggies diaper packs. If you're like me, you are buying most of these items from Target on a regular basis anyways, so these deals and specials are like icing on the summer cake! Even though we're only down to one kiddo in diapers (holla at the potty trained HDawg! ), we still buy a lot of them. As soon as I heard about the sale this week, I picked up a few boxes of Pampers and scored a couple of $10 gift cards. I know, such a glamorous purchase but it's a necessity. I also stocked up on some of our favorite Target baby essentials- lightweight summer Carters pajamas and BabyGanics sunscreen. Finally, I made a big baby gear purchase during the big sale this week- we are now proud owners of a BOB Revolution Duallie Stroller. You guys know David is a big runner and while I'm not, I do like to get out there and run every once in awhile. We've been eyeing this double jogging stroller for awhile so we can do family runs. And by that, I mean David zipping along pushing 60+ lbs. of baby while I struggle alongside him solo. Anyways, armed with a great Target price and the free $20 gift card incentive, the stroller finally became ours this week. Like I said, the sale only lasts through Saturday, so head over to check out the baby gear on the Target website and stock up on your favorite baby summer essentials! *Thank you to Target for partnering up with me on this post and supporting our baby sale shopping spree!